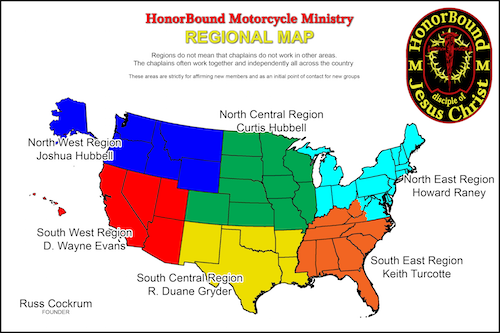 Release: Each rider & passenger on the ride (on their own behalf and on behalf of their heirs, personal representatives, successors and assigns), for and in consideration of HonorBound Motorcycle Ministries (“HBMM”), General Council of the Assemblies of God, (“AG GC”), Assemblies of God US Missions (“AGUSM”), Assemblies of God Chaplaincy, Assemblies of God Men’s Ministries, Assemblies of God Motorcycle Chaplains, and any affiliated sponsors and contributors permitting them (or their child, who is under 18) to participate in the General Council 2017 Ride , and for other valuable consideration, the receipt and adequacy of which are hereby acknowledged, releases and discharges HBMM, AG GC, AGUSM, AG Chaplaincy, AG Men’s Ministries, and any affiliated sponsors and contributors, their respective officers, directors, employees, agents and districts from any and all claims and demands, rights and causes of action of any kind whatsoever which they (or their child) now have or later may have in any way resulting from or arising out of or in connection with their participation in the motorcycle ride or other related events. This Release extends to any and all claims them (or their child) have or may have against the released parties whether such claims result from negligence (except willful neglect) on the part of any or all of the released parties with respect to the motorcycle ride, other events, or with respect to the conditions (including but not limited to road, weather and traffic conditions), qualifications, instructions, rules, procedures and routes under which the motorcycle ride and other events are conducted, or from any other cause. Consent: Consent is also hereby given to HBMM, AG GC, AGUSM, AG Chaplaincy, AG Men’s Ministries, and any affiliated sponsors and contributors to use their (or their child’s) name, picture or portrait or likeness, audiotape or videotape recordings and sound or silent motion pictures of them (or those of their child) from this event in any media for editorial comment, educational, promotional and advertising purposes for the solicitation of contributions and for any other purpose in furtherance of the objectives of HBMM, AG GC, AGUSM, AG Chaplaincy, AG Men’s Ministries, and any affiliated sponsors and contributors. Attest: They are experienced in and familiar with the operation of motorcycles and fully understand the risks and dangers inherent in motorcycling. They are voluntarily participating in the motorcycle ride and other events and they expressly agree to assume the entire risk of any accidents or personal injury, including death, which I might suffer as a result of my participation.